This soup is our pride and joy. 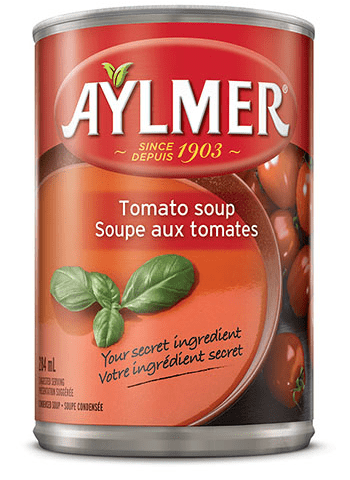 Few soups taste more like home than Aylmer Tomato Soup. We have been chosen the No. 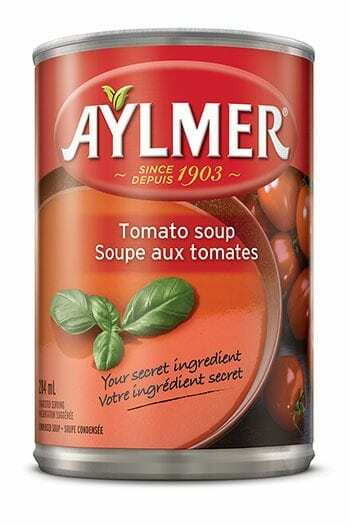 1 Tomato Soup in Quebec year-after-year thanks to the amount of effort we put into the selection of our ripened Roma tomatoes, the slow cooking of each batch and the unique richness of our combined hot, sweet, sour and umami seasonings. Our simmering and blending result in a great flavour base on which to build for individual tastes and to create other great meal ideas. In a large pan, cook the beef and vegetables in oil until the meat is properly browned. Add the rest of the ingredients and bring to a boil. Reduce the heat, cover and allow to simmer for at least 2 hours. In a large bowl, mix the meat, half a cup of soup, bread crumbs, egg, onions, thyme and pepper. Pour into an 8 x 4 inch bread pan. Cook in the oven at 350ºF for 1 hour or until it is well cooked. In a small saucepan, heat the rest of the soup with the chili sauce. Serve with the meat loaf.